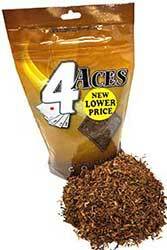 If you’re looking for a rich smoking experiences that’s satisfying while still being a bit mellow, then 4 Aces Pipe Tobacco is what you need! 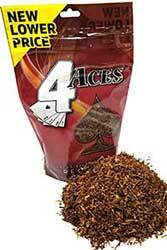 4 Aces Pipe Tobacco offers smokers a variety of premium pipe tobacco that will satisfy their cravings. Smokers will thoroughly enjoy the smooth taste and appealing aroma of all their products. 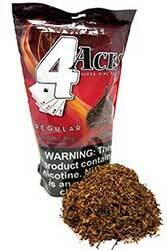 What makes 4 Aces Pipe Tobacco so pleasing is that it’s quality tobacco at affordable prices. 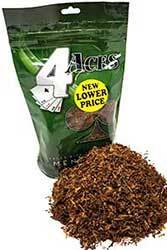 The lose and fine cut tobacco blends come in several delicious flavors, including 4 Aces Mint, 4 Aces Turkish Blend, 4 Aces Silver, 4 Aces Regular and 4 Aces Mellow. You’ll love how moist and refined the texture is as it entices your senses. Pipe enthusiasts everywhere will love all the flavors and will want to try them all. 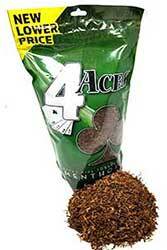 Each one has distinct aromas and flavors, but they all have the same quality fans have come to expect from 4 Aces Pipe Tobacco. 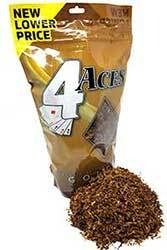 Whether you’re a habitual pipe smoker or simply an every-now-and-then enthusiast, 4 Aces will satisfy your discerning tastes. All flavors are smooth and delicious, making for a relaxing smoke experience you won’t find anywhere else. Only a few puffs are needed to really know you’re smoking quality tobacco!